I went on a soulful vacation. My soul had been rejuvenated, my faith had been restored. Etsy and my jewelry business came across my mind once in a while, I do miss them, but I know I had to slow down to go further. 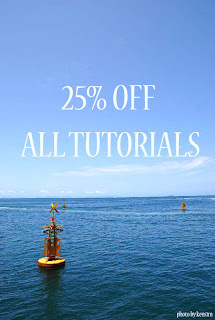 I have many inquiries mail that asked me if there is any discount if they buy more tutorials. I told them no then - simply because I did not have enough tutorials to have such offer that time. Looking at my store now, I have 9 tutorials available for purchase, and I know I will be writing more. So I would like to make this possible to you. I am offering more than 25 percent off the original total price. For regular customers, I thank you very much for your support and your kind words, without you I will not be able to do what I am doing now. I will continue to maintain the quality of the upcoming tutorials, and I look forward to serve you best and offer you better. At any one time if you see my work and would like to know how I made them, please feel free to contact me, I will be more than happy to share with you of what I know. You can also pay for the tutorial via PayPal by sending $68.00USD to decors.l@gmail.com by specifying "ALL 9 TUTORIALS" in the title of the transaction, or click on the below Add to Cart button to purchase. The PDF format file will be sent to your E-mail address specified in your Paypal account.